The Petro Poroshenko Bloc is against declaring martial law in Donbas. 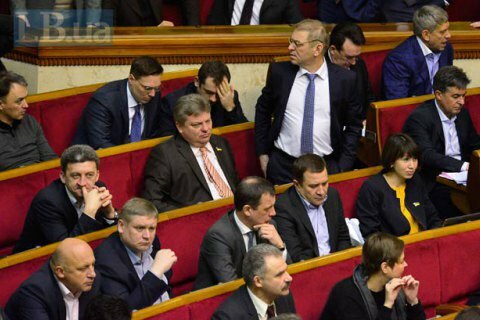 The faction of the Petro Poroshenko Bloc (PPB) will not support the law on occupied territories authored by Self-Help (Self-Reliance), MP Serhiy Berezenko (PPB) has told an LB.ua correspondent. "We have a lot of disagreements about the provisions set forth in Self-Help's bill. These include closing the border with the temporarily occupied territories, thus cutting that part out and forgetting about Ukrainians who stayed on the temporarily occupied territories," Berezenko said. He said the PPB is against the introduction of martial law in Donbas. Berezenko was not sure whether the faction is going to support the bill on the occupied territories sponsored by PPB MP Mustafa Nayem. "The faction has no position, and I have not read it yet," he said. Meanwhile, the People's Front faction has drafted and submitted its own bill on the occupied territories, a source in the faction told LB.ua. "There will be a similar bill from the People's Front. In fact, it will not be any different from Self-Help's bill," the source said. When asked if parliament is going to support the bill, because Self-Help's effort was much criticized for radicalism, the source said that "the bill is being prepared in the cabinet, so the PPB will vote for it."